As usual it feels unreal when Boston Marathon finally is there. Starting in December with your training and fighting long runs in bitter cold temps and winds. 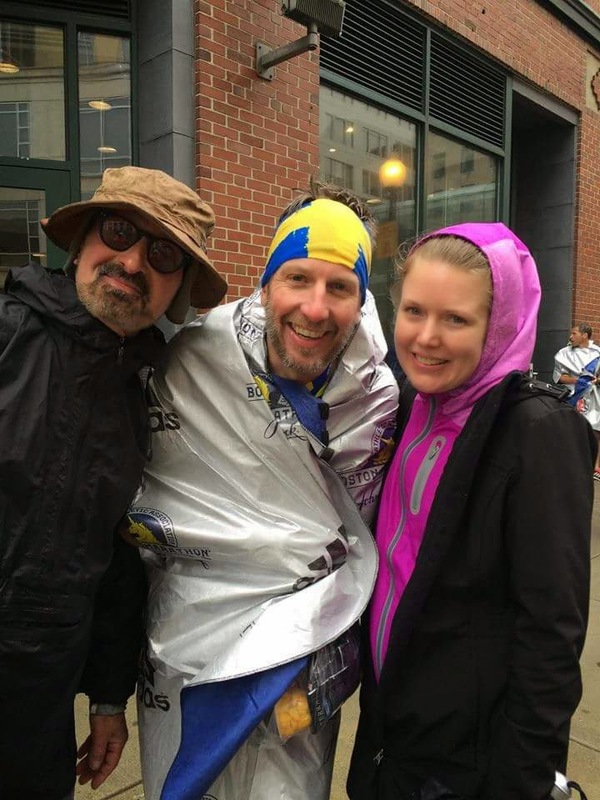 The cold weather was a never ending story this year and it also became the signature of the 2015 edition of Boston Marathon. In other words I was prepared! This year me and my family was traveling up to Boston, Saturday morning. I was going to help out at the Salming Running booth at the expo. Car ride went smooth beside a small detour in Boston as our friend Waze GPS app did not have clue about Boston exits! (app is now deleted). 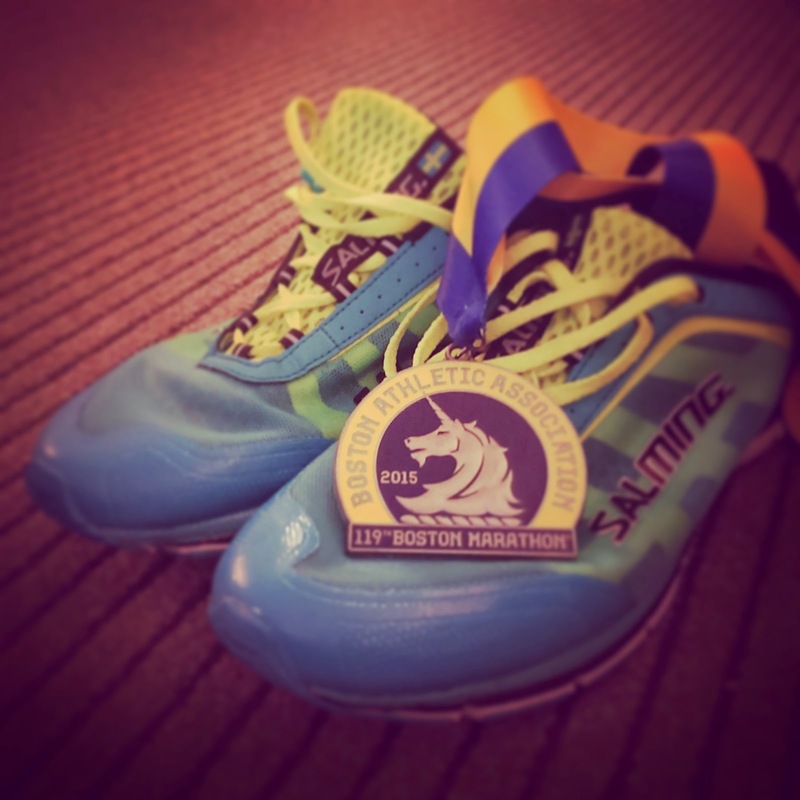 I had no desire really to walk the expo this year, went straight to meet the Salming Running staff. The Salming booth was located in a narrow aisle across from Boston Olympics booth and not far from Samuel Adams, this means a lot of traffic of visitors. For the first time and finally I got the opportunity to meet the Salming crew Tor, Anders and Tom. All very passionate about running and knowledgeable, I felt like I was "home", also got the opportunity speak Swedish with Anders. Anders and I are from the same region in Sweden. 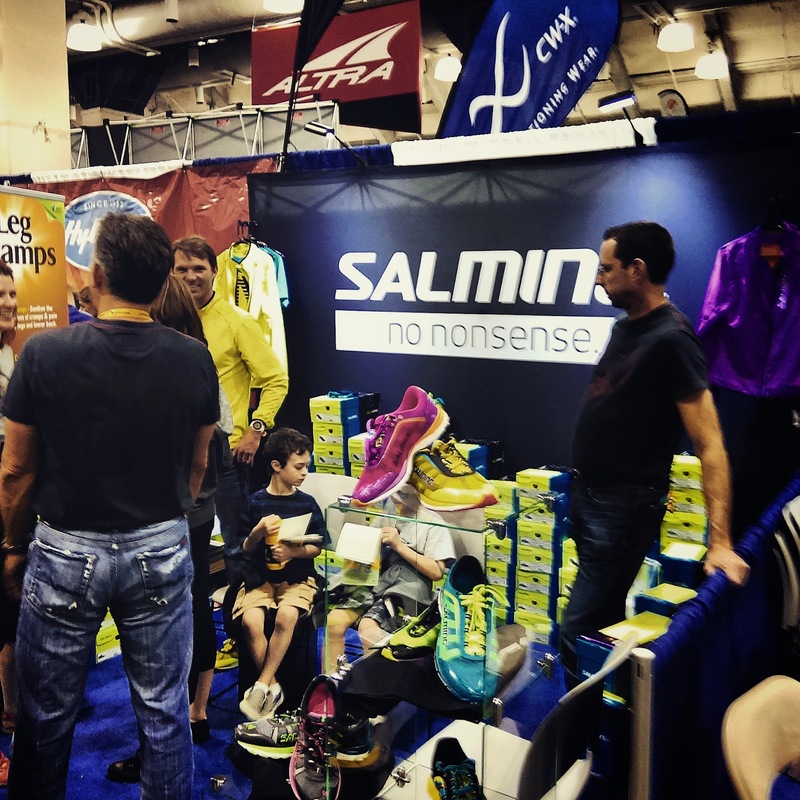 I always enjoy the expo part, connecting with runners and friends like Seth Hasty (finally got to show him Salming shoes), I was happy to be with a Swedish brand this time. Sunday, is about rest and get prepared. We did some easy walking downtown and had lunch. 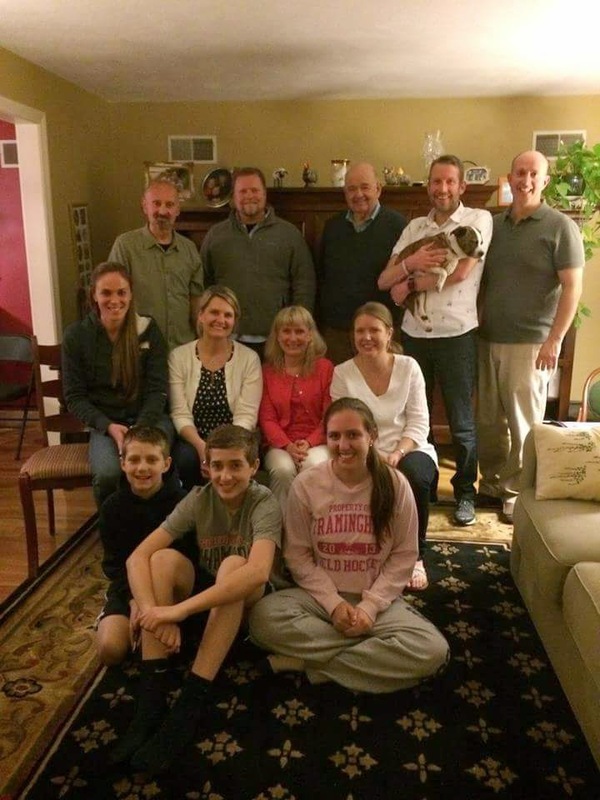 We always do the traditional family dinner at the Cosgrove's in Framingham. Dinner was spot on for my taste. Pasta, sweet potatoes, some beets and grilled tofu. Again I had the same planning as two years ago, I was going to stay closer to the start and stay with Ted and Maria. Their hospitality is gold worth and I get an extra hour of sleep as the drive is only 10 minutes to the start. Race morning. Alarm was set to 6:15am. First a quick shower, followed by a oatmeal and bagel breakfast. Close to 7am Ted and Maria drove me to Hopkinton. I have seen "Athletes Village" and the mess and long lines to the Porta Johns, so I decided to stay close to the start and have pretty much direct access to 200 porta johns. As I get nervous close to start I need that option. I was lucky to get a spot under a roof, as it started to rain light and the winds had started to pick up. I was chatting to a nice guy from Toronto/Ontario. Boston is always great in that way, making new friends and connections. Around 9:20am I started to walk up to the start, rain had stopped at this point. All preparations were done, I had my Salming Speeds and Singlet on and I had my beet shot. Race mood was on! Forecast for the race had predicted light rain and east winds up to 20mph! Race. The last 30 min before start always goes quick. You listen to the presentations of the Elite fields and the national anthem. I kept a poncho on until last second, to stay warm. 10 o'clock the start gun went of. It took approximately 2:40 for me to get to the start line and to get the my official start time. For the long downhill section of the course (all the way to mile 16-ish), don't let yourself run faster than target goal pace. The "bank time" strategy is a TRAP in Boston. Instead, let the downhills make the effort less strenuous, and instead bank some energy for the last 10 miles. Through the Newton Hills, the focus should be on staying efficient and not emptying the tank. Expect to give back 10-ish seconds per mile through this section, which will only put you 1 minute "behind" when you get to the top of Heartbreak Hill. Once you hit 21, put the hammer down. If you've been smart to this point, you will have the legs to make up the minute you lost on the hills and then some. Focus on passing as many people as possible to stay motivated, and enjoy the crowds! First mile is always packed it's hard to find the rhythm. I always try to stay calm here and not spend my energy zig zagging thru the crowed. My first mile was right under 7min. After the first mile the field started to split up and I started find my rhythm. At this point the winds and weather did not bother me. Around mile 5, I meet a familiar face, Kenth from Sweden. Kenth started ahead of me and it was inspirational to catch up with him. At mile 6, I meet family for the first time and got a bottle with Skratchlabs. I also started to take my gels at the 40min mark, after the 40 min mark, I took a gel every 20 min. I felt comfortable between mile 2-8. Around mile 8 the rain started again, this time hard. You got soak wet within seconds and your body got cold. I tried to move on but I had to put in more effort then I wanted to at this point. I also started to feel that I needed to take a quick pit stop. Right before the Screaming tunnel I stopped quick, lost about 20 seconds, I was not worried about this at this point. Between 8-15 it was tough, but that is the nature of a marathon, you go thru different stages. I did put trust in my training and I was sure I could work myself out of it. Mile 13 I got my next bottle of Skratchlabs, I took a few sips with a couple of salt tabs and moved on toward the Newton Hills. When I started the first Newton climb, I realized that I started to pass a lot of runners, everything started to feel easy a proof that I had done my pacing right. I was able to keep almost my 6:45 pace during the Newton Hill segment of Boston Marathon. 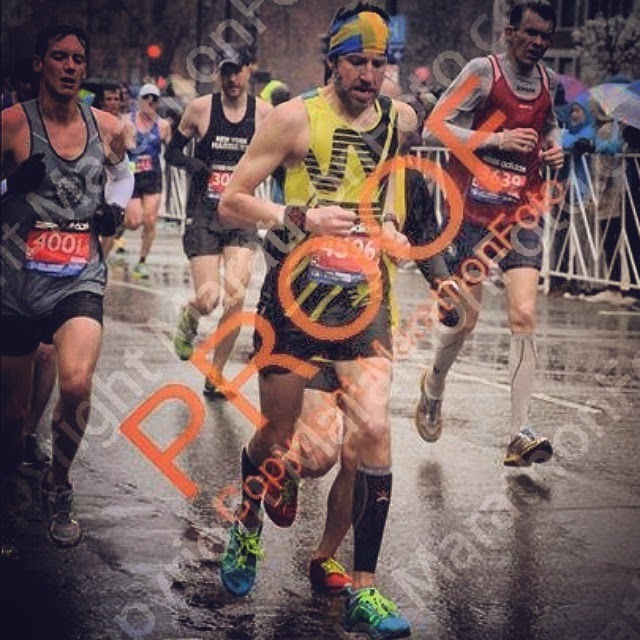 Before I knew it I was on top of the Heartbreak Hill with only 5 miles to go. I checked my watch and could tell that I had a good chance to go under 3 hours. I decided to give a good push at this point. Targeting mile by mile and to chase down runners. It worked really well and I kept my energy. At miles 23 I meet Kenth again, I lost him after my pit stop earlier in the race. Also my wife Erin and family would be at mile 24. I was very happy to see them and I knew at this point that I would go under 3 hours. Although I was worried about my history with late marathon stage cramps. I decided to back off a little the last 2 miles to play it safe. Not pushing another cramp. Coming in to Boylston Street is always amazing, although Boylston is longer then you think. The crowed is just great. I just sucked everything in! With a perfect execution of my plan my time was 2:57:53. Its easy to think what my time would have been on a perfect day but I had trained in worst conditions then wind and rain and I was prepared! so excited for you stefan! 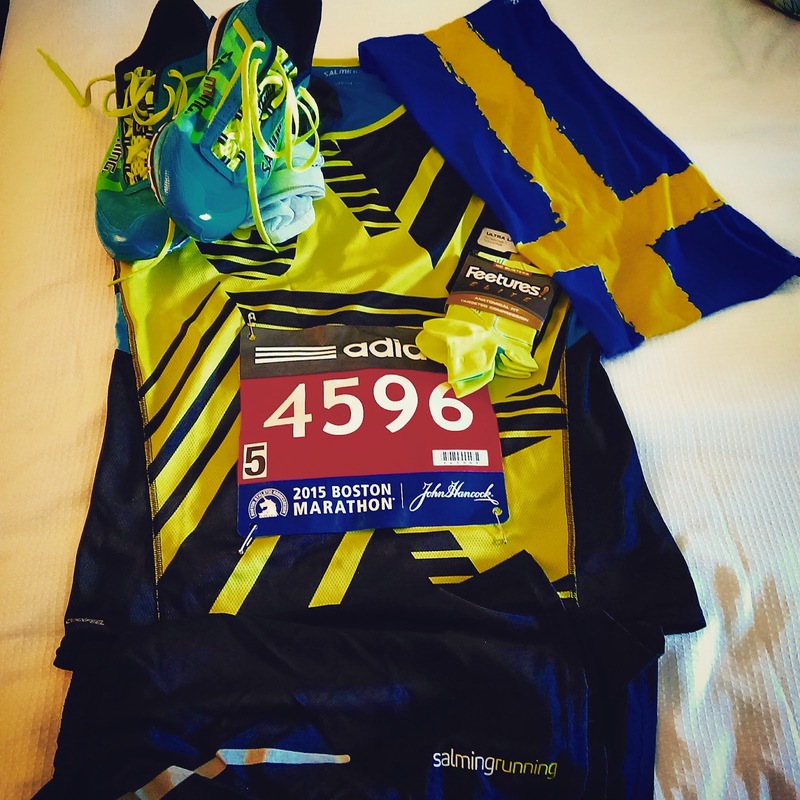 way to make team wicked bonkproof, sweden and salming proud. i am all gung-ho to be at the hopkinton start line in 2016 - really hoping to meet you there!